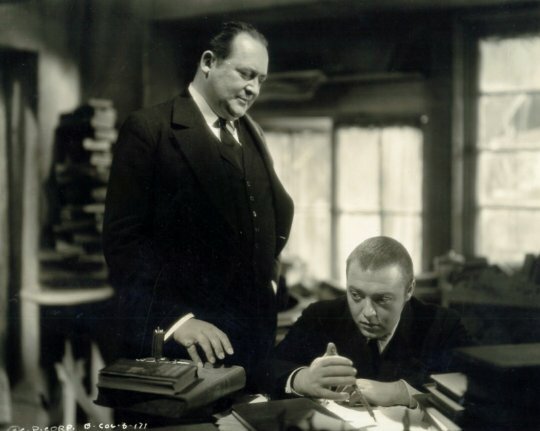 Raskolnikov is often translated to mean “schism” or “dissent,” which made Dostoevsky’s celebrated anti-hero a fitting role for Peter Lorre to take on soon after he emigrated from National Socialist Germany. While Lorre had an affinity for the existential literary source novel, the part would also foreshadow the psychopaths and villains that would become his stock-and-trade. Mill Creek Entertainment celebrates the eightieth anniversary of Josef von Sternberg’s Crime and Punishment with a special DVD reissue, on-sale today. It was eighty years ago when Crime and Punishment first released in theaters, but you probably thought it wasn’t a day over seventy-five. At least eighty is a reasonably round number. Frankly, any excuse to watch a Peter Lorre film is valid and this is a rather interesting one his fans may not be so familiar with. Roderick (as he is here known) Raskolnikov is indeed a brilliant intellectual, with Nietzschean ideas about crime and morality. He is too perversely proud to accept help from his college friend Dmitri, opting to murder a parasitic pawnbroker instead. In a departure from the novel, he will not be interrupted in the act by the loathsome woman’s sister, but he still loses his superhuman cool, rushing off without most of the crone’s money. Much to his surprise, Raskolnikov’s guilty conscience immediately troubles him. It only gets worse when an innocent man is arrested for the crime. Nevertheless, he instinctively shifts into defensive mode when the intrepid Inspector Porfiry calls for him, again and again. Ostensibly, the copper seeks Raskolnikov’s consultation as a brash young criminology theorist, but it is clear he suspects the poor garret-dweller. Raskolnikov becomes increasingly isolated and alienated, yet the fallen but still devout Sonya persistently offers him spiritual comfort during some of his darkest hours. All things considered, the 1935 Crime and Punishment is surprisingly faithful to Dostoevsky, including the various subplots involving Raskolnikov’s sister Antonya. Still, Sternberg reportedly never liked the film due to distinctly un-Russian flavor, references to Siberia notwithstanding. However, the film’s ambiguous setting gives it a timeless universality that was arguably ahead of its time. Lucien Ballard’s black-and-white cinematography is also quite striking at times, especially for its use of shadows and reflections. Regardless, everyone knows the reason to see C&P is to watch Lorre do his thing. Of course, at the time nobody knew how many twitchy villains he would play. In retrospect, C&P looks like something of a fork-in-the-road film, where his future Joel Cairos and Corman Poe madmen branch off from his Brechtian collaborations. He also happens to be terrific as the increasingly agitated Raskolnikov, particularly in his nifty cat-and-mouse scenes with the under-appreciated Edward Arnold. As Porifry, Arnold looks like Broderick Crawford, but acts like Colombo. The haunting Romanian Tala Birell further contributes to the film’s continental flavor as the exquisitely tragic Antonya. It is hard to envision the 1930s studio system truly plumbing the existential depths of a tortured Nineteenth Century Russian crypto-anarchist, but thanks to Lorre’s bold performance, Sternberg’s adaptation makes a pretty good go of it. Lorre fans will enjoy it for all the reasons they relish his classic films co-starring opposite Sydney Greenstreet. 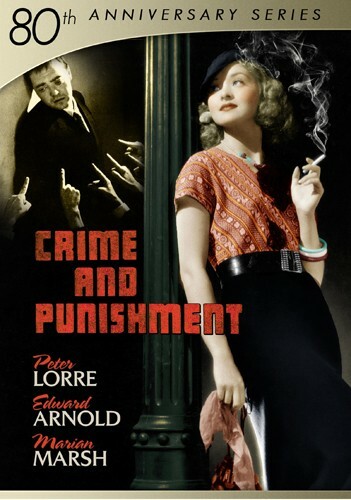 Affectionately recommended for classic film buffs, Crime and Punishment is now available on DVD as part of Mill Creek Entertainment’s Anniversary series.